A wonderful place to experience the Canal du Midi and learn its history. Seuil de Naurouze is significant as the watershed point on the Canal du Midi. The word seuil means threshold, and from this point water from one side goes to the Atlantic, and from the other to the Mediterranean. The architect of the Canal du Midi, Pierre Paul Riquet, envisioned three reservoirs here to manage the flow of water. In the largest, Le Bassin, he proposed putting a statue of the King in a chariot pulled by sea horses. He apparently had big plans for the Seuil de Naurouze, hoping to build a city around it modeled after the Place Royale in Paris. However, his dream wasn't realized, and so modern visitors get to enjoy the beautiful countryside. Today the large basin remains, surrounded by plane trees and some delightful walking and biking paths. You can also walk or bike along the Canal du Midi to a nearby lock and if a boat is coming through, see the lock in action. 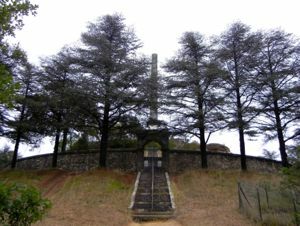 Nearby is an obelisk that honors Riquet, built in the early 1800s. Although you can see it from a variety of angles and walk around it, the monument itself is fenced off and inaccessible. It stands on a large pile of rocks, called narouze, separated by fissures. Legend says that when the rocks fuse, the world will end. Enjoy it while it lasts! It's a wonderful place for a walk and a great chance to see the engineering marvel of the historic Canal du Midi and its locks. You can even glide through it if you join a canal barge cruise. 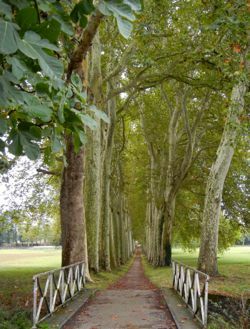 Above, Beautiful plane trees along the Canal du Midi at Seuil de Naurouze. Below, Monument to Pierre Paul Riquet.